I was never totally convinced by this composition, until the cat was added. 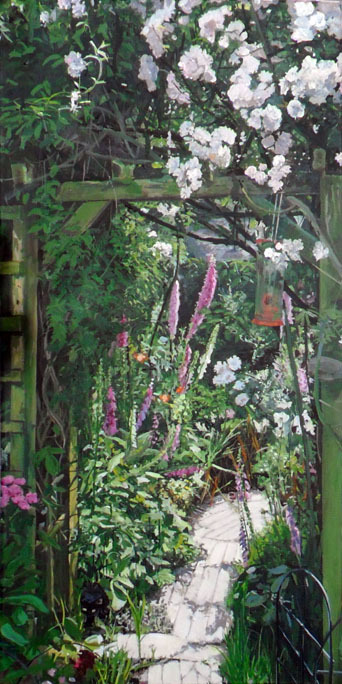 As with picture 36 “The Garden and Beyond”, this view is based on a photo of my Aunt and Uncle’s garden in Belper. I worried that there was not really any centre of interest even though one is loosely lead through the arch. I thought the piece would rely on thorough detail, which felt like a long time coming. Indeed, I painted much of the initial work with the canvas on its side, to see the piece as shapes and colours rather than specific things. In fact the complexity of the image perhaps leads to a sort of “where’s wally” aspect to the piece. The cat and birdfeeder have to be found within the mélé. I liked the idea that the “Empty Birdfeeder” might be the cat. In fact the starring cat was based on one of my neighbours new kittens as it was skulking guiltily behind a bush in our front garden. I like the fact that it is clearly summer even though much of the image is quite dark.